DC Comics, Warner Premiere, Warner Home Video and Warner Bros. 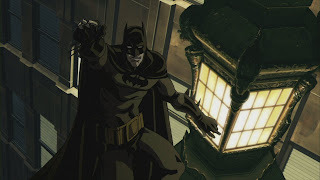 Animation have collaborated to create a unique Batman experience in Batman: Gotham Knight. The all-new, original movie will arrive July 8, 2008 on DVD and Blu-ray Disc. Order due date is June 3, 2008. The original movie will also be available OnDemand and Pay-per-View as well as available for download on the same day as release date, July 8, 2008. Batman: Gotham Knight is a fresh and exciting new entry into the Batman mythos, spinning out of a 40-year history in animation including the Emmy®-winning Batman: The Animated Series, widely considered a pivotal moment in American animation. A cross section of distinguished creators, award winning producers, and acclaimed writers weave six interlocking stories that reveal Bruce Wayne’s journey to Dark Knight, each with stylish art from some of the world’s most revered animation visionaries. Batman: Gotham Knight was headed by an impressive list of directors who have brought their distinctly different anime styles to the classic Batman character. The production was divided among three renowned studios – Studio 4ºC, Production I.G and Madhouse – and included the truly inimitable visions of directors Shojiro Nishimi, Futoshi Higashide, Hiroshi Morioka, Yasuhiro Aoki and Toshiyuki Kubooka. With stories written by several of the most talented writers of film, comic books, and animation, including Academy Award®-nominated screenwriter Josh Olson (A History of Violence), David S. Goyer (Batman Begins), Emmy®-winner Alan Burnett (Batman: The Animated Series), Jordan Goldberg (Associate Producer, The Dark Knight), and award-winning comics writers Greg Rucka and Brian Azzarello, Batman: Gotham Knight presents thrilling new adventures of Batman that spotlight several of Gotham City’s most dangerous villains, including the fearsome Scarecrow, the freakish Killer Croc and the unnerving marksman known as Deadshot. Batman: Gotham Knight is produced by Emma Thomas (Batman Begins, The Dark Knight), Michael Uslan & Benjamin Melniker (Batman Begins, The Dark Knight), Toshi Hiruma and Bruce Timm (Batman: The Animated Series). Batman: Gotham Knight will be available on DVD for $24.98 SRP. There will also be a 2-disc Special Edition DVD available for $29.98 SRP which contains additional bonus features. All the content from the 2-disc Special Edition DVD will be available on Blu-ray Disc for $34.99 SRP. -"A Mirror for the Bat: The Evil Denizens of Gotham City" - A stimulating documentary covering Gotham City’s most nefarious of characters, combined with a look into the symbiotic relationship Batman shares with his enemies. -Audio Commentary - Featuring the filmmakers of Batman: Gotham Knight. -"Batman and Me, A Devotion of Destiny: The Bob Kane Story" - The comprehensive chronology of the remarkable life of the creator of Batman. -Batman: The Animated Series Bonus Episodes - Bruce Timm selects his favorite episodes from Batman: The Animated Series. “To date, over 13.5 million units of Batman animated titles have been sold and we are thrilled to release Batman: Gotham Knight, the next installment of the DC Universe animated original movies, which will be a hit with Super Hero and comic book fans alike,” said Amit Desai, WHV Vice President, Kids and Sports Marketing. Batman: Gotham Knight will be supported by a massive media campaign including primetime TV spots, national print and online coverage. Marketing support will also include strong promotional support as well as a grassroots viral campaign. DC Comics, Warner Premiere, Warner Home Video (WHV) and Warner Bros. Animation (WBA) began the production and distribution of DC Universe, a series of original, animated PG-13 movies in July 2006. This original made for DVD movie is part of the DC Universe series of animated PG-13 films written and directed by acclaimed comic book creators and animators and featuring recognizable talent. WHV will be the exclusive worldwide home entertainment distributor for all DC Universe movies, which will include a slate of 2-3 action-packed films per year. Superman Doomsday and Justice League: The New Frontier were the first DC Universe original animated movies. Other DC properties with films in development include Justice League, Green Lantern, Flash and Wonder Woman. Warner Premiere is Warner Bros. Entertainment’s new direct-to-consumer production company focused on the development, production and marketing of feature-length content, as well as short form digital content for the growing home entertainment market. Warner Premiere is committed to being at the creative forefront in the evolution of quality product in the direct-to-DVD business and the digital space, creating material that exemplifies the commitment to story, production and brand equity for which Warner Bros. is known. With operations in 90 international territories Warner Home Video, a Warner Bros. Entertainment Company, commands the largest distribution infrastructure in the global video marketplace. Warner Home Video's film library is the largest of any studio, offering top quality new and vintage titles from the repertoires of Warner Bros. Pictures, Turner Entertainment, Castle Rock Entertainment, HBO Home Video and New Line Home Entertainment. DC Comics, a Warner Bros. Entertainment Company, is the largest English-language publisher of comics in the world and home to such iconic characters as Superman, Batman, Wonder Woman and the Sandman. These DC Super Heroes and others have starred in comic books, movies, television series (both animated and live-action) and cyberspace, thrilling audiences of all ages for generations. DC Comics’ Web site is located at www.dccomics.com. Warner Bros. Animation has been producing award-winning original animation since 1930, when it released its first cartoon, “Sinkin' in the Bathtub.” Since then, Warner Bros. Animation’s characters have set the standard for innovative, quality animation. Producing for network and cable television, online, home entertainment and feature films both domestically and internationally, Warner Bros. Animation is highly respected for its creative and technical excellence, as well as maintaining the studio’s rich cartoon heritage. Warner Bros. Animation also oversees the creative use of, and production of animated programming based on classic animated characters from the Hanna-Barbera and DC Comics libraries. Warner Bros. Animation is one of the most honored animation studios in history, garnering a grand total of six Academy Awards®, 35 Emmy® Awards, the George Foster Peabody Award, an Environmental Media Award, a Parents’ Choice Award, a Humanitas Award, two Prism Awards and 20 Annie Awards (honoring excellence in animation).